One of my favorite parts of the Halloween party I hosted was my spider web favors that I included for each guest. I picked up six glittery spider rings from Party City for $.25 each (yep!). Their sparkle went splendidly with my metallic color scheme. 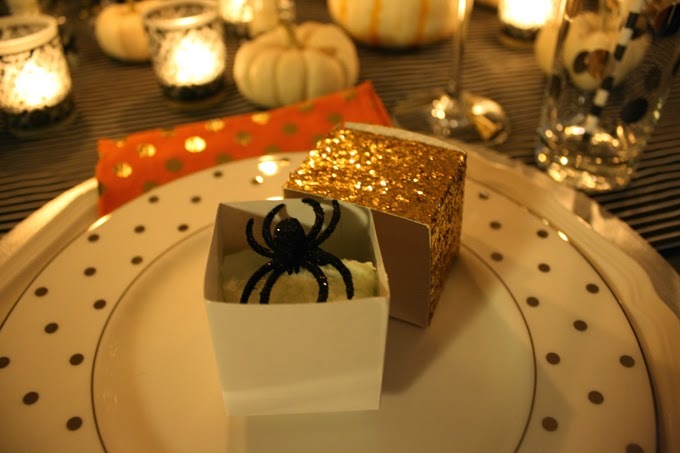 I then filled the All that Glitters favor boxes from Kate Aspen with cotton candy and topped every box with a spider ring. The cotton candy looked just like a spider web, and gave guests a sweet treat as well as a thematic bauble. They were a hit and were incredible easy. Win win! Cute idea and affordable - love it! Thanks, sweet friends! Yes, MAJORLY affordable! That's the best part!